Examples of nutrient density scores. 70 calories of each food is shown here. “Nutrient Density” refers to the ratio between the amount of beneficial nutrients in a food and its caloric content. Foods high in nutrients (like antioxidants, vitamins, minerals, fiber) and low in calories get a high (favorable) nutrient density score, while foods low in nutrients and high in calories get a low (bad) score. There is no single authoritative nutrient density scale, but all of the systems I’ve seen, whether on a 1 - 100 or 1 - 1000 scale, arrive at similar findings. When you look at the leaderboards, the powerhouses are always dark leafy greens like kale, chard, collard greens, and spinach. Dark leafy greens are low in calories and contain many antioxidants, calcium, nitrates, carotenoids and other phytonutrients. Other low-calorie, nutrient-rich vegetables follow, such as romaine and Boston lettuce, broccoli, artichoke, and cabbage. Some rankings might surprise you. Even whole foods like bananas, nuts, avocados, and brown rice rank low on nutrient density scales because of their calorie count—i.e., you can get equivalent amounts of nutrients in foods that are much lower in calories. Not surprisingly, fast food, processed food, oils, sugary foods, meats, dairy, and eggs are low on all nutrient density scales. Most Americans believe that lots of protein and low levels of fat and carbs are the keys to health and slimness. The obesity rate in the U.S. would suggest that these beliefs are not working. In reality, a focus on whole foods high in nutrients (vitamins, minerals, phytochemicals, and other amazing micro-nutrients) would help improve our health. Nutrients help the body function properly, including the immune system and cellular repair mechanisms, which protect us from chronic diseases. People who call themselves “nutritarians” focus on eating as high on the nutrient density scale as possible. Dr. Joel Fuhrman, MD, is the best known proponent of nutritarianism and the person who coined the term. He offers books, welcome kits, checklists, and cookbooks. 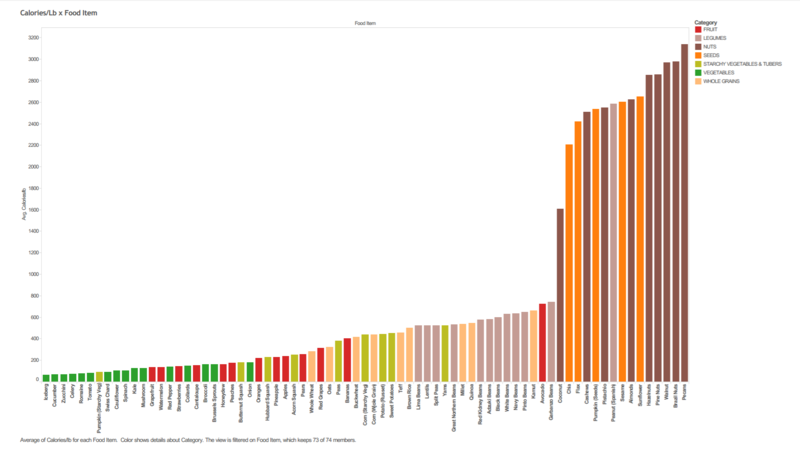 You can download a .pdf copy of Dr. Fuhrman’s nutrient density chart. If you don’t have to watch your weight, you can ignore this post. For the rest of us, the 99%, “caloric density” matters. Big difference, yeah. But we all could have guessed that one. Some otherwise healthy plant-based foods are relatively calorie-dense. Fruits and vegetables have the lowest caloric density, as we see from the apple example. Fruits and vegetables tend to have high water content, high fiber content, and low fat content. This means they provide a lot of bulk without a lot of calories. Grains are higher in caloric density than the majority of fruits and vegetables. Whole-grain and refined grains don’t differ much in calories, but whole grains offer more fiber, which slows the movement of food through your system. Fiber also regulates sugar levels and helps keep you fuller longer. Oils and butter are the most calorie-dense foods. Oil is 100% fat, and butter (even vegan butter) is nearly that, too. Caloric density matters if you want to avoid hunger pangs. Eating lots of fruits and vegetables means you can eat more and feel fuller. But you can’t live on fruits and vegetables alone—you need protein and grains too. Tilting the balance toward fresh fruits and vegetables and trying to include them in every meal and snack will help you feel satisfied. Using dried fruit and nuts between meals to stave off hunger can be dangerous if you really do need to watch your weight. They are deceptively high in calories, even though they are much healthier for you than chocolate cake. If you want a visual representation of the caloric density of dozens of foods, download this chart. When you’re trying to get loved ones to eat your meatless dishes, we all know you have to meet them partway. If one or more of them is a food neophobe, you’ll have to be even more careful and strategic. Food neophobes may decide they don’t like a dish even before they taste it, because they’re automatically averse to any unfamiliar food. But many food neophobes want to eat less meat. If you can find the narrow path to lead him or her to new meatless favorites, you will both have reason to be proud. Are You or Someone You Know a Food Neophobe? If you’re old enough, you might remember Mikey from the Life cereal commercial of 1972. His brother says, “I’m not gonna try it. Let’s get Mikey. Yeah, he won’t eat it. He hates everything!” (Watch the ad). Perhaps you’re not as bad as Mikey, but you like what you like, and you don’t appreciate other people pushing you to try things you’re not interested in. Or are you on the opposite end with Anthony Bourdain? He’s the Food Network personality who travels the world in quest of culinary adventure, eating ant eggs, sheep testicles, and cobra hearts. Maybe you’re not the ant-egg-eating type, but you like trying a new dish on the menu, you jump at the chance to visit a new restaurant, or you lose hours on the internet picking new recipes to put on your stack. If you or someone you know is more like Mikey, it may be a case of food neophobia. It’s a real thing, validated by years of research. For people who are reluctant to try new foods, it’s not just at the moment of tasting that the dislike occurs. Hearing an unfamiliar dish name, reading about unusual ingredients, skimming a description of an untried food, or just looking at a new dish can all elicit a prediction of dislike. (My husband, Doug—a confirmed food neophobe—once said about a soup, “If I ate with a blindfold on, this would be better.”) It’s often hard to tell whether a food neophobe’s dislike of a dish is because of the taste, or whether it’s a self-fulfilling prophecy, a conscious or sub-conscious justification of the pre-tasting judgment. Fortunately, there are things you can do to successfully introduce new ingredients to a food neophobe, and I have some tips below. Find out if you or someone you know is a food neophobe. Take the test here (it requires only a few minutes). Can Food Neophobia be Changed? Food neophobia appears to be hard-wired in a similar way to personality traits. In one study of female twins, the results suggested that food neophobia is highly heritable: around 67% may be due to genes. Like personality traits (extraversion, conscientiousness, etc. ), food neophobia can be changed, but only to a degree. Increased exposure to new foods can lower the level of one’s food neophobia. But more experience with unfamiliar foods doesn’t completely counterbalance an innate and instinctive aversion to new foods, no more than learning to speak in public turns an introvert into an extravert. If you are someone who is trying to introduce more meatless dishes to your spouse, partner, and/or children, you might have an increased challenge if there’s a food neophobe under your roof. I’ve found the following six strategies to be helpful in planning and serving plant-based dishes to my husband and other family members who fall on the neophobic end of the scale. For a food neophobe, if there’s anything worse than an unfamiliar ingredient in a meal or dish, it’s an unfamiliar ingredient in an unfamiliar meal or dish. I learned this the hard way with my husband. For example, I first tried Textured Vegetable Protein (TVP) in a new recipe: Mexican Pasta Skillet. After Doug roundly rejected it, I thought TVP would never work. But another time I tried TVP as the basis for a “meat” sauce to go on spaghetti, and he gobbled it up. The same thing happened with TVP tacos—no problem. Duh, he already loved spaghetti sauce and tacos, and he’d never had anything like a Mexican pasta dish. I’ve found the most success when Doug only has to confront one new ingredient at a time. Early on during our vegan dinner experiments, I thought I’d have an easy winner with vegan nachos. I made a “cheesy” vegan sauce from scratch and a taco-beef-like mixture made from meat crumbles. I piled the tortilla chips high and buried them in the taco mixture and cheesy sauce. Doug wanted to like them but couldn’t eat more than a few—too much change at one time for a food neophobe. Never underestimate how a favorite condiment or side dish can help a new dish go down. Doug loves mango chutney, sweet chili sauce, and ketchup, so I make sure to highlight the condiment when serving a not-yet-loved dish. Doug’s favorite side dishes work the same way. Roasted asparagus, baked French fries, fresh corn on the cob, and semi-homemade baked beans have all done their part to increase the acceptance of new ventures. Everyone tends to like a dish better if they’ve had a voice in choosing it. When possible, let them decide on broccoli or cauliflower, green or fruit salad, lentil or split pea soup, these leftovers or those tonight? There is a subtle shift of ownership to the person making the decision, and he or she is likely to be more pleased by the meal than otherwise. I made the mistake early on of trying one new dish after another, without repeating any of the new dishes for months. Sometimes when we had a new dish a second time many months later, Doug rejected it. I eventually figured out that I needed to repeat any new dish that he liked within a month in order to lock it into his memory as safe and tasty. I recommend saying as little as possible about what’s in the new dish unless specifically asked—give it a nickname (“Dad’s New Enchilada Casserole”) instead of a clinical name (“Tofu-Quinoa-Poblano Enchilada Casserole”). You can cite someone’s praise about the taste of dish, or lightly talk about its healthiness, but don’t come on too strong. Perhaps the hardest rule of thumb is accepting the rejection of new dishes by your resident neophobe. It’s so tempting to whine, “But you love peanut butter! This sauce is mostly peanut butter; it’s on top of broccoli and rice, and you like those too!” Reasonable argument, but the neophobe is not responding to food on the basis of reason. I’ve found that no amount of arguing changes my husband’s mind once he’s decided. And the debating can make meal time more fraught with anxiety in the future. Better to calmly note the dislike and move on. Use your energy on figuring out how to win your neophobe over to the next dish. The keys are persistence, baby steps, and understanding. If you’re cooking for a food neophobe, remember that somewhere deep in their brain is a strong distrust of new food—it’s part of their survival instinct. You can coax them to like new meatless dishes, and when you do, the accomplishment will be all the sweeter. Many of us love curries of all kinds. But when you stop and focus on the differences between Indian and Thai curries, you realize they're quite different, but in a good way. Some of the differences can influence your meal planning--e.g., Thai curries can be made more quickly than Indian, meaning they might be better when you don't have much time. Here are two classic curries, Indian Eggplant, Chickpea, and Spinach Curry and Gracious Vegan Green or Red Thai Curry. Enjoy! Please see my blog "Yup, Food Neophobia is a Thing" for an introduction to food neophobia and the implications for home cooks trying to get loved ones to eat more meatless meals. 2. I don’t trust new foods. 3. If I don’t know what is in a food, I won’t try it. 5. Ethnic food looks too weird to eat. 10. I like to try new ethnic restaurants. More than 20 points means that you are a food neophobe. 20 or fewer points mean you are in the food neophile category. 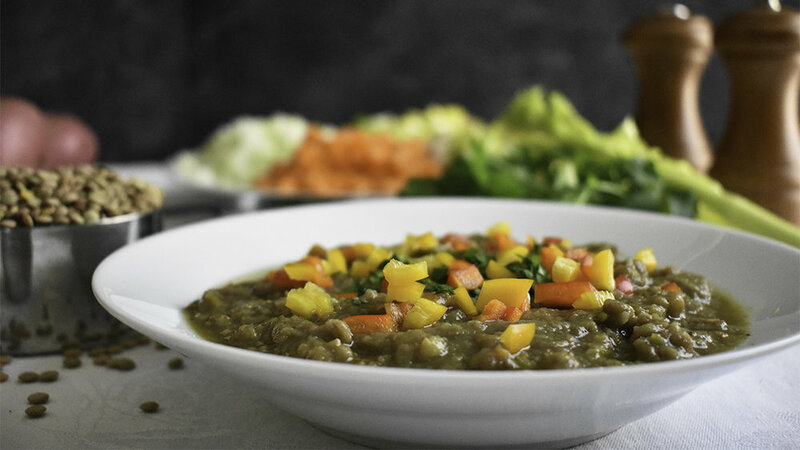 Lentils are one of the fastest cooking legumes (they’re tender in 20-25 minutes), they go well with lots of other foods, and they're super-healthy. Lentils are an excellent source of fiber, protein, iron, zinc, antioxidants, and folate. A diet rich in lentils and other legumes may help reduce cholesterol, hypertension, and the risk of prediabetes. Check out these recipe recommendations for delicious lentil recipes. Tahini is a thick sauce made from toasted, hulled, ground sesame seeds. Sesame seeds are very nutritious, providing phytonutrients such as omega-6 fatty acids, flavonoid phenolic anti-oxidants, vitamins, and dietary fiber. Those of us who love falafel know “tahini sauce”; it’s a mixture of tahini paste, lemon juice, garlic, and water. My favorite oil-free salad dressing is Gracious Vegan Oil-Free Tahini Dressing, where the tahini provides a creaminess that’s similar to ranch dressing. Tahini is also a star in many dips, such as Real Simple's Red Pepper, Walnut, and Tahini Dip. I cook a lot of soups—I love homemade soups. But I don’t have time to make homemade vegetable broth. The prices of canned and packaged broth put me off, because I use so much. What works for me is powdered broth. I use Seitenbacher’s Vegetable Broth and Seasoning, which is easy to buy on Amazon (I recently bought a six-pack). It seems expensive when you first buy it (over $4 for a 5-ounce can), but, at one teaspoon per cup for making broth, it lasts a long time. When you agreed to let your son invite his girlfriend to Thanksgiving, who knew she was a vegan? Good thing you asked in time. Or maybe someone new is coming who has a dairy or egg allergy. Yeah, just about every traditional dish has eggs or dairy in it. Thanksgiving’s hard enough without having to make a bunch of separate dishes for the rabbit-food types. First, let’s level the playing field. If you aren’t sure what vegans eat and don’t eat, go to this site for a quick overview. Second, let’s address the elephant in the room, or should I say the Tofurky in the room? I’ve been a vegetarian-then-vegan for 35 years and have never bought or eaten a TofurkyÒ Roast. It may be exactly right for some folks, but I prefer homemade fare, so don’t assume you have to go there. Here are seven ways you can accommodate your vegan without spending a lot of extra hours on special dishes. 1. Buy a pound of vegan butter (the most widely available brand is Earth Balance). Buy the four-bar pack instead of the spread, then you can use it in recipes (see suggestions below), and the vegan can use it like butter for spreading on rolls and melting on potatoes or other vegetables. Earth Balance is available in most large grocery stores and it tastes better than you might imagine—don’t knock it till you’ve tried it. 2. Buy some non-dairy milk. Most vegans like all varieties—soy, almond, rice, or cashew milk. Make sure it’s unsweetened so you can use it in recipes. Plus your guest can add it to coffee or tea over dessert. 3. Serve as many “accidentally vegan” foods as you can. Cranberry sauce is vegan, both the canned variety and homemade. Applesauce and green salad (with a non-dairy dressing) are vegan. Would you believe that Pillsbury Crescent Rolls are vegan? Yup. Homemade rolls usually contain eggs, butter and milk. You can either make a batch of Pillsbury rolls for your vegan or buy a nice baguette. Green Beans Almandine: just a fancy name for green beans topped with vegan margarine and sliced almonds. Baked Sweet Potatoes: delicious with margarine, salt and pepper. Just wash, dry, and pierce the potatoes with a fork. Bake in a 375° oven for about 90 minutes, until soft. Candied Yams: You can substitute vegan margarine for the butter and you’ll have vegan candied yams. Roasted cauliflower, Brussels sprouts, or butternut squash: Roasting vegetables is easy. Wash and cut them into bite-size pieces, toss in olive oil (1 tablespoon per pound of vegetables) and salt, then bake at 425° for about 30 minutes. Other side dish recipes from the Gracious Vegan. 5. Consider veganizing your mashed potatoes and/or bread stuffing. You can substitute vegan margarine and non-dairy milk for the butter and cow’s milk in your mashed potatoes recipe. These substitutes work really well, and I’d be surprised if any of the omnivores noticed the difference. If you cook your bread stuffing “in the bird,” the vegan can’t eat it. But it’s easy to make all or part of your stuffing in a baking dish. Just use vegan margarine instead of butter, and leave out the eggs if they’re called for (add a little extra liquid instead). If you want to go all-out, your vegan would love some gravy. High-end grocery stores might offer store-made mushroom gravy around Thanksgiving. There are also a number of dry mixes you can quickly whip up into decent vegan gravy, like Hain, Simply Organic, and Road’s End. You can order the packets online or find them in health food stores or organic sections. 6. Don’t worry about a turkey substitute. If you provide your vegan with all or most of the foods mentioned so far, don’t worry that there’s no main dish for him or her. They won’t miss a turkey substitute, and, since they won’t experience the post-dinner turkey coma, the vegan can do the dishes for you. 7. Make an easy vegan dessert. There are many vegan desserts that would be delicious, but if you need something fast, I recommend chocolate or fruit. You won’t believe how delicious silken tofu chocolate mousse is (here’s Nasoya’s Tofu Chocolate Mousse recipe). An easy fruit dessert is baked apples/pears or apple/pear crisp—just use vegan butter instead of dairy butter in your favorite recipe. Most grocery stores (Trader Joe's is great) sell one or more brands of vegan ice cream—for topping off the fruit dessert—just sayin’. Unfortunately, there’s no easy way to veganize pumpkin pie. Other desserts recommended by the Gracious Vegan. After a long day of work, you’re famished. You walk into the kitchen. Yes, you should have stocked the fridge with healthy snacks like you read about, but you didn’t, and now you’re stuffing your face with something that's bad for you. What about dinner? You’re so hungry, you want to go with take-out, but you know too much of that gets expensive and unhealthy. You decide to cook. You’re trying to cut down on meat, but almost all the recipes you know start with chicken or beef as the main ingredient. What’s in the middle of the plate if you don’t eat meat? It’s just going to take some planning, adjustment, and time for meatless cooking to become as second-nature as meat-centered cooking is now, but you can do it. Here are my top tips for making progress on taking the meat out of dinner. Cut down gradually. Don’t revamp your dinners all at once. Try new recipes once or twice a week and treat them as experiments. This is a marathon, not a sprint. See my collection of recipes chosen carefully from hundreds of websites and tested to make sure they’re tasty and reasonably quick. Be good humored if you meet resistance. Some family members may voice displeasure with the new dishes, or the idea of going meatless in the first place. I recommend avoiding arguments or long explanations about the benefits. Just be breezy about it, telling them you’re experimenting with new recipes that are healthier. If you think they’re willing, have them watch one or more of the documentaries or videos about the connections between diet and disease. Deep down most adults realize that meat and dairy aren’t very good for them, but they may not be ready to say that. Don’t immediately use tofu, tempeh, seitan, or other meat substitutes. I’ve seen many family members turned off by these ingredients, especially at first. There are plenty of recipes (like the ones in my collection) that don’t call for these ingredients. On the other hand, some new products, like Beyond Meat, have become popular. They have several different beef and chicken varieties and might be worth a try if you can find them. Supplement entrees with side dishes and salads. To avoid complaints that the new dishes aren’t filling enough, make one, maybe two, easy side dishes that will fill out a hearty meal. Please comment below, ask questions, or send me an email to let me know how it’s going. Keep up your spirits. If you’re like most of us, you grew up in a household where dinner centered on meat. You inherited family recipes whose main ingredient was meat. Websites and magazines churn out hundreds of new recipes every day featuring meat as the main ingredient. It isn’t easy to un-do all that. Don't give yourself a guilt trip, and do this gradually but consistently. Best of luck! You’ve decided to decrease your meat, eggs, and dairy. Great! You’re in good company—with celebs Ellen DeGeneres, Christie Brinkley, Michelle Pfeiffer, and 3+ million other Americans—making a strong commitment to life, health and the environment. So, um, what are you going to eat later today … and tomorrow… and the day after that? I have a suggestion that will keep it simple for the first week (or two or three—whatever) as you more deeply explore meatless, egg-less, and dairy-free eating. My suggestion is to create a go-to list of foods you already like that happen to be plant-based. You can use this list when you’re racking your brain over what to eat—when it seems like there’s nothing you can choose from. Meatless eating will become easy and second-nature after you get the hang of it, but a list can help at the beginning so you eat tasty, satisfying food when you start. In my opinion the go-to list shouldn’t exceed about 20 items—any longer and it might become cumbersome. I’ve provided some examples below. You’ll need to create a list that works for you. I recommend carrying the list with you on your phone or a piece of paper. It will come in handy. Check out recipes and menus on this site for more ideas. I’ll be adding ideas for additional quick breakfasts, lunches and dinners. We don’t want to get too fancy the first week or two. Keep it simple, keep at it, and give it time to become your way of life. Best of luck as you embark on your new path. Please enter any questions you have in the Comments section and I will answer them.